While anxiously reading every possible piece of news about the Chevrolet Bolt as I await mine, I learned that another award happened–Time magazine named the Bolt one of the 25 Best Inventions of 2016! It does seem to be in between the too-expensive but long-range Tesla and the limited-range other guys in the Bolt’s price range. I’ve been reading posts on Facebook from my Chevrolet Bolt EV Owners Group, and folks have a variety of things on their minds–some of which hadn’t crossed mine. I don’t really care how the heater works, for example, although it’s a question for EVs, which don’t have the radiator fluid to use as a source of heat. Some are waxing positive on the styling–others less so. The seats fit some but not all. People in states other than California and Oregon are grousing about having to wait for their dealers to have any in stock. I’m expecting my car before January 1st, and every day I wait to hear if it’s built yet. But soon, this space will be where you can get the skinny on what it’s like to live with one of these groundbreaking cars. Chevrolet Bolt in the Flesh! Finally, I’ve seen and touched a real Chevrolet Bolt! I got my chance at the San Francisco Auto Show, where they had a single car. And–it was the same Kinetic Blue that I’ve ordered mine in! And, as a Premier level model, it was essentially identical to my long anticipated new ride. I approached it from the front, and it looked, well, like it was supposed to look. It’s not large, but it’s not small either, and stands tall–nearly as high as a crossover, but not as chunky. The smiling face had the fill panel with energetic lines on it and a big gold Chevy logo and gleamed in the show lights. The paint looked lustrous and I ran my hands over the car, “petting” it, to get a true feel of the body. The chrome trim is not skimpy, and the roof rails are a gleaming silver. The taillamps are bold, with a sharp edge along their tops and the “electronic” theme pattern in them. The new logo is different from the Volt’s. I popped the hood, which proved to be very lightweight, and used a prop rod. The flat, silvery motor is tucked in there, minus the usual radiator, water pump, and other internal-combustion-engine accouterments. There is still a container up front, but it looks like folks are being warned NOT to put radiator fluid in there. I stepped inside. It looked like the photos, but I also got the sense of height and the gray/white contrasts. I think this is the lighter interior scheme–the one I ordered–with partial white on the seats and a white lower half of the dash. The doors are dark, with just a little white extending into the top. Plastics are good GM grade, but not Audi level luxury. 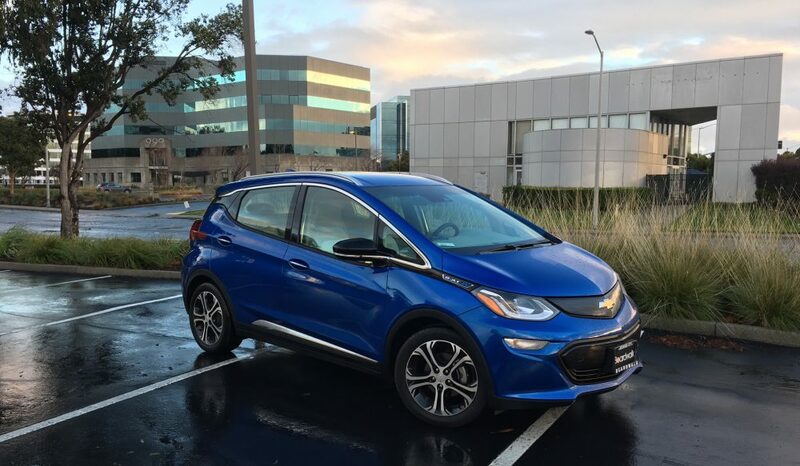 We all understand that the premium pricing of the Bolt, for its size, is for the 900-pound battery, but the fittings seemed well done and similar to the all-new 2016 Volt, its plug-in hybrid sibling. The instrument panel was totally blank, as today’s screens are, so I couldn’t evaluate it, or see anything on the center display either. The thick, leather-wrapped wheel feels good in your hands, and has the requisite redundant buttons for audio, info, phone, cruise control, and even a heated steering wheel. The rearview mirror is thick, as it also functions as a backup camera (when the car’s on). The seats are narrow but nice and firm–perfect for 167-pound me. A large person might not take to them as well. The back bench sits higher than the front buckets, for good visibility but also leaving plenty of battery space below. I tried sitting behind the driver’s seat that was set for me and had a couple of inches of legroom, so a Bolt should accommodate full sized folks back there. The rear hatch wasn’t operational (they turn off all EV functions for these cars at shows, apparently), but we were able to drop the rear seats and see the space in back, including the sturdy “false floor” that provides a smooth surface and also hidden storage. The car was just sitting there, without signage or hoopla, but two nice young women were there to answer questions, and we had a pleasant conversation. One of them took a few really nice photos of me with my beloved car. I also spoke with numerous other show goers who were interested, and that provided a sense of camaraderie. I expect I’ll be having more of these when I get mine, and I welcome that as a chance to sound the rallying cry of Go Green! I should have some help in that, since the Bolt, this week, won three important awards. First, it’s the 2017 Motor Trend Car of the Year. It’s also named to the Car and Driver 10Best list, and is the Green Car of the Year, from Green Car Journal, announced at the Los Angeles Auto Show. An auspicious start. Now, I’ll await word from Don Mays, my salesman at Boardwalk Chevrolet in Redwood City, California, that my car is built and on its way. He told me that delivery is expected before Christmas, so that’s about a month away. I’m eager to put it on the road to see what it can do. I was walking through the mall tonight with my wife, just after purchasing new sheets at Pottery Barn and look what I saw. It’s the new Kia Niro! I’ve heard about this hybrid crossover for a while now, and expected to see one on the road or at a dealership soon. This one is here to show off. Kia is smart to introduce a compact crossover, sized between the boxy Soul and the venerable Sportage, that has similar fuel economy to a Toyota Prius. The new Prius, the poster child for hybrids and the highest performing one, fuel economy wise, is an acquired taste visually. What folks seem to want now are crossovers, and the new smaller ones are hot hot hot. So Kia is in the catbird’s seat here. I sat down in the car, and although I couldn’t get the seat to adjust (the battery, apparently was drained), I could tell that Kia is using the same clear, no-nonsense styling inside, with premium materials, to convey high competence, value for the money, and in the case of a crossover, that ride high feeling. The Niro has a dual clutch six-speed automatic–not a CVT–so you can feel the gears shift normally and even move them manually. Of course, I didn’t sample that in the mall, but the Niro should at least emit a more sonorous sound than the moan of a CVT. The 1.6-liter four-cylinder engine, mated to a 43 hp electric motor, contributes to the overall 146 horsepower. That motor will likely be as smooth and silent as motors are. My understanding is that there will be a hybrid and a plug-in hybrid version. The young woman managing the display gave me a free Niro bag to carry things in, and took my information for future updates. Of course, I expect to hear from the automotive PR folks at some point soon, but this’ll tell me what interested car shoppers will get. The thank-you email told me I could download the Niro app and configure a car on my iPad, so I did that. It took a while to download. It shows a musical video of the Niro zooming through a city – with no driver… Is this a look at their future autonomous vehicle? Then–out to the country! A quick roll through a charging station (not stopping) and onward. You can click a button periodically to get details on the topic they’re presenting, such as Exterior Tour and Fuel Efficiency, all shown to a high-tech beat. I’ll be looking forward to a real test of this car soon. Chevrolet Bolts are In Production! Finally, the assembly line is running at the General Motors Orion Assembly Plant in Orion, Michigan, and Bolts are moving slowly down the line. The news story I found mentions the sad news that only California and Oregon will get cars before the end of the year, but luckily for me, I’m in California, and my order is in, so I am hoping to see my car something before the end of the year. It’s an interesting experience in 2016, when instant gratification is the norm, to have to wait for anything. I knew that I wanted an EV, and I knew that the Bolt was the only realistic choice, since it’s (relatively) affordable and has a great range, with its big 60 kWh battery. So, I dashed down to place my order. But nearly a month in, waiting feels as interminable as the conclusion of the 2016 election. While the latter event is literally right around the corner, I’m not sure when I’ll see my Bolt. And, I’m not sure exactly how much it’s going to cost me on a monthly basis. Figuring that my car would be with me at least 30 months, I went for the nicer Premier model, with a few upgrades, like leather seats, and upgraded the stereo and safety features, so it’s $43,000 or so before they take the $7,500 off for the Federal tax credit. Then, there’s California money coming to me too, $2,500 worth, as I understand it. But I’ll have to decide how much to put down to keep those payments reasonable. I’m also turning in my ancient 1993 Plymouth Voyager minivan, my occasional car that will now go to gas car heaven. I plan to put it out to pasture when I’m assured of my Bolt delivery date. I haven’t bought myself a new car since November of 1990, when I got my Saturn. It was exciting to sell my Honda and buy a new car that was a brand new brand, too. I was the first guy on my block to have one, and I got some attention. I even got noticed by Hal Riney and Partners, who had the Saturn account, so I ended up on the cover of the 1994 Saturn brochures! My Chevy salesman says he’ll keep me posted on the progress, so I will, at some point, know the status of the build and when it gets put onto a transporter truck for its western trip. Watch this space for updates. And, visit my new venue, Clean Fleet Report, for my EV and hybrid writings.